Piñata cakes! These should be a controlled substance. 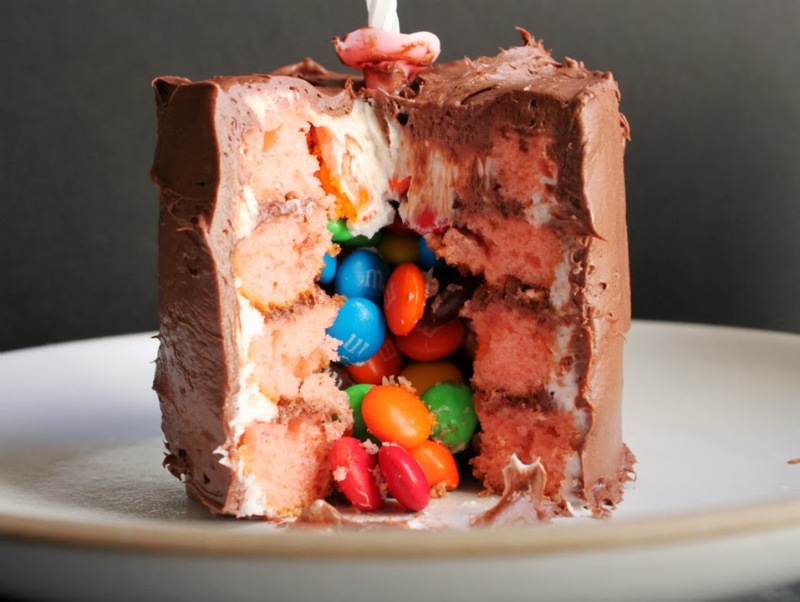 You need to have them under control, and share one of these little piñata cakes between three or even four people or you will be hurting. They are sugar bombs. But they are really festive and make little girls' eyes pop out of their heads when they see them. I know because I witnessed this first hand at Stella's birthday party last week! I first saw a piñata cake earlier this year at A Subtle Revelry. 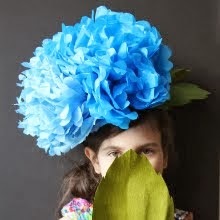 Victoria's piñata cake is so gorgeous (see here), I just love it. 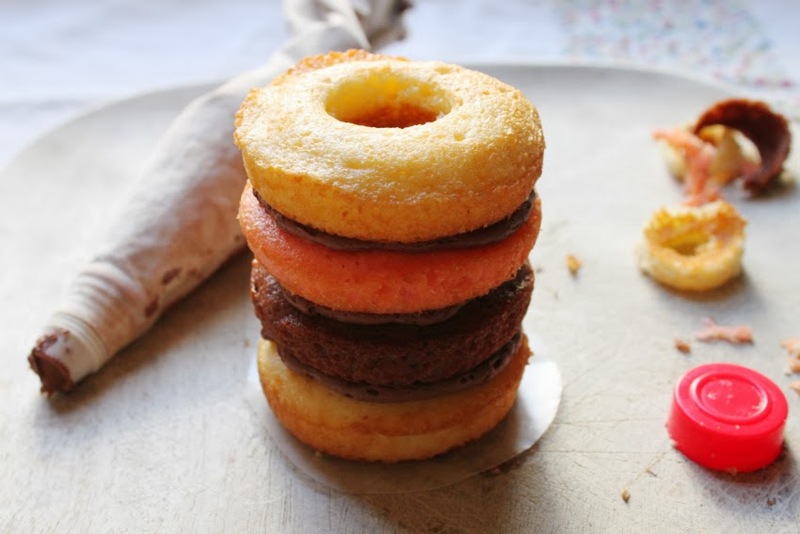 I have had layer cakes on my donut pan to-do list for ages, but it didn't hit me until just a week or two ago that the donut form is not only perfect for stacking, but is also perfect for filling! 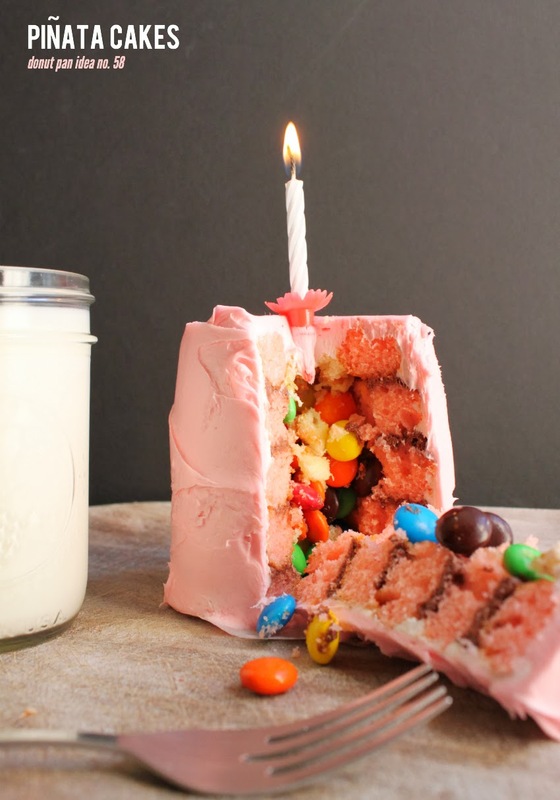 Filling the centers with candies gives them the right to be called piñata cakes. I also love their small diameter and unique proportions. It's all pretty simple. Click on "read more" below to read more on how to put these together. You're going to have to do the math to suit your needs here. 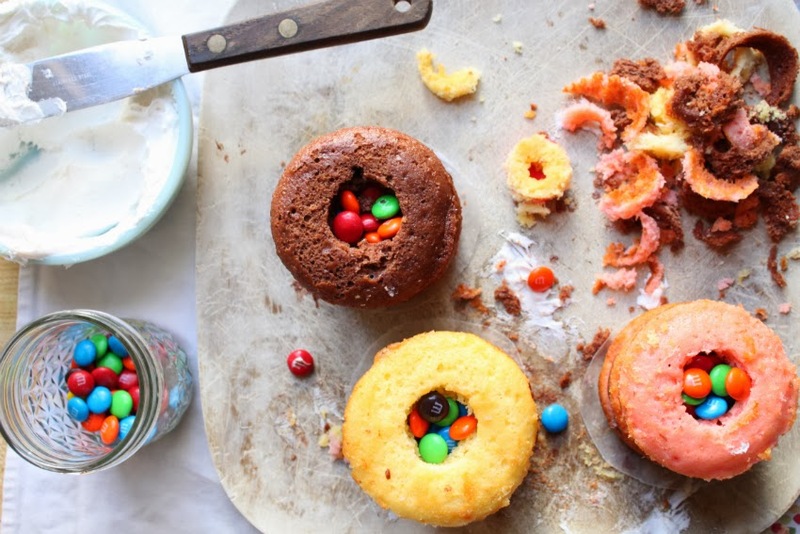 If you want to layer three cake flavors together in the piñata cakes you are going to end up with 24 more donuts than if you only layer two flavors together. 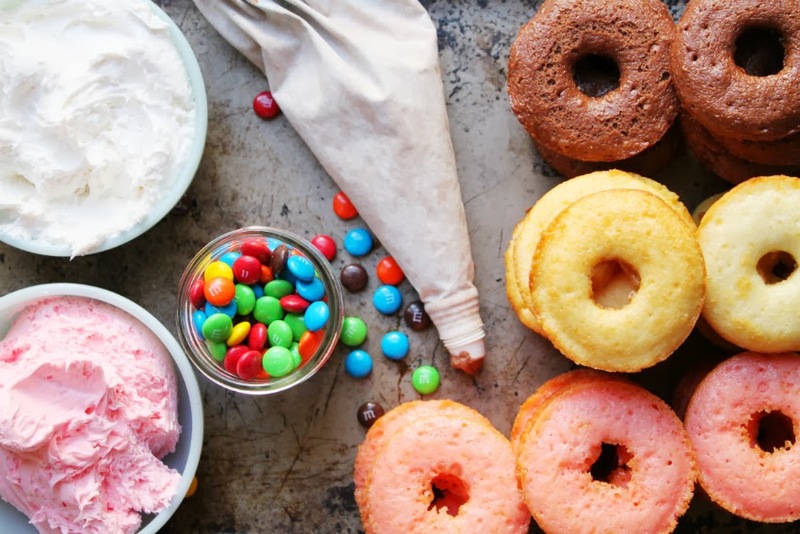 You can use one box of cake mix (or a cake recipe with enough batter for two cake rounds) but you will end up with only one flavor of cake donuts, and only six piñata cakes. WHICH IS FINE! TOTALLY ENOUGH! I, however, used three cake mix boxes which yielded 18 layered piñata cakes. Even after Stella's party we are swimming in little cakes over here! So do your math. Bake your cake batter in donut pans greased with baking spray at the temperature given in the recipe or on the box for about 20 minutes. Let cool completely. For a Neapolitan look, I used strawberry, vanilla and chocolate cake batter. Along with the cake donuts, you will need a proportionate amount of frosting. I used one tub of strawberry, one tub of chocolate, and two tubs of vanilla, all whipped for ease of application. (Note: Please don't judge! This is the most corn syrup laden donut project I've ever done. I just didn't have the time to make this all from scratch, but you know I could've!) 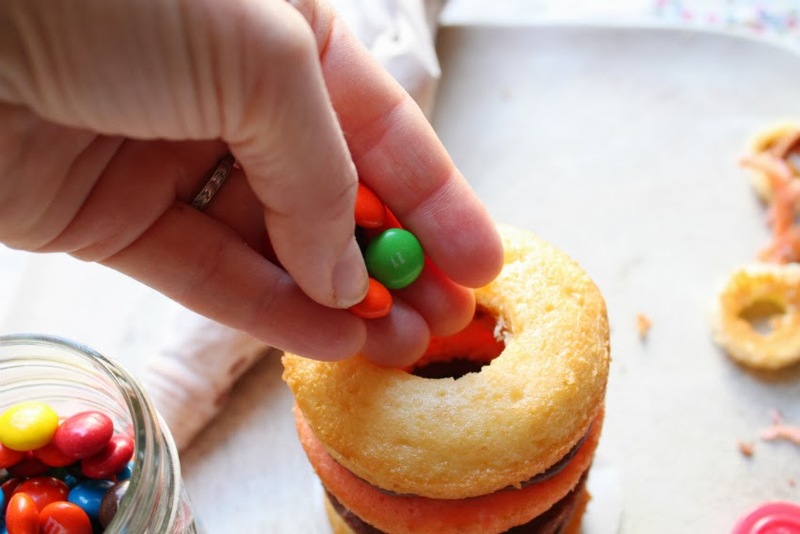 You will also need candies like M&M'S for the centers, a pastry bag with no tip, and waxed paper cut into circles a little larger than the donuts themselves. Start by making the donut holes a little larger. 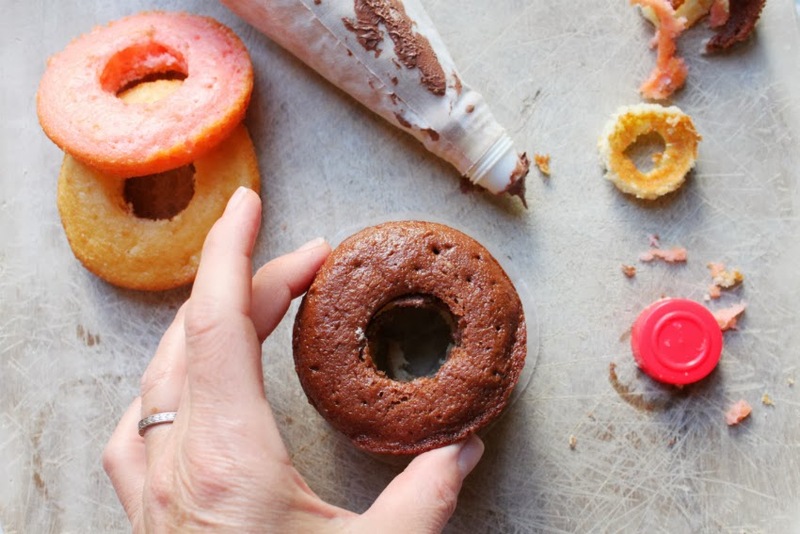 I used the cap off of some sugar sprinkle decorations as a cookie cutter of sorts, pressing it into the center of the donut and removing that interior bit of cake. When you've cut the centers of your first four donuts, you can begin stacking them. 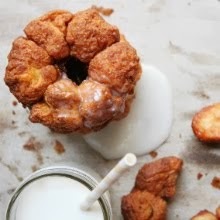 Set the bottom donut on a circle of waxed paper. Apply a thin layer of frosting with the pastry bag. Place the next "layer" of cake on that layer of frosting, and repeat until you have a stack that is four donuts high. Fill the center with candies. Repeat this as many times as you'd like, or until the donuts are all gone. 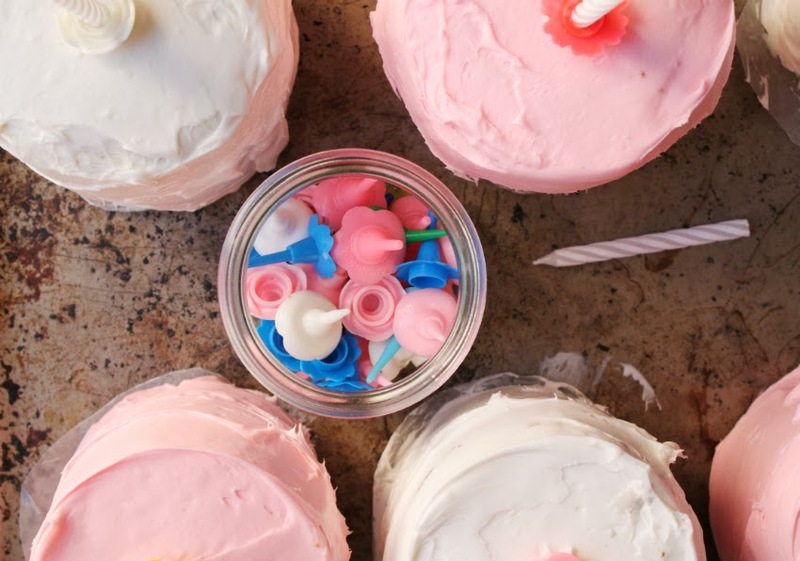 Next you're going to lay the scratch coat of frosting. This is the layer of frosting that will trap the cake crumbs inside, making it much easier for you to frost the final outer layer. 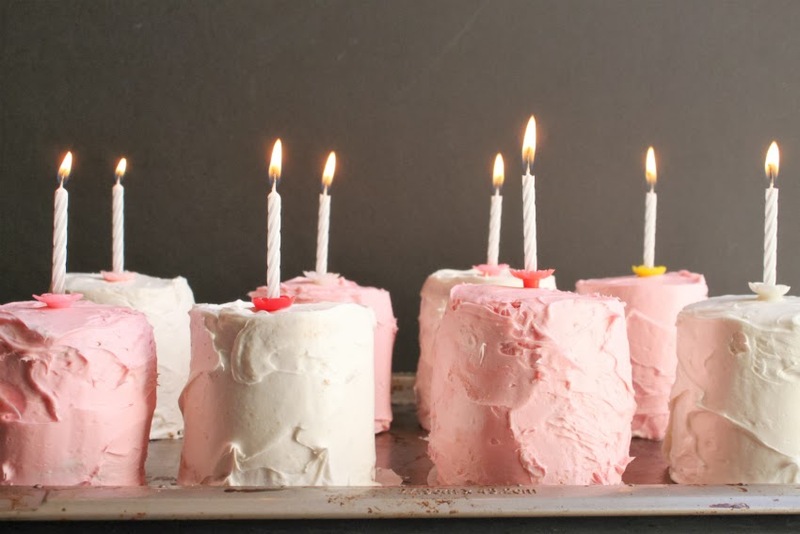 After spreading the scratch coat of frosting all over the piñata cake stack, slip a spatula under the waxed paper circle the cake is sitting on and transfer to your freezer. Freeze each as soon as you frost it, as you want them to sit in the freezer for about a half hour before you finish them up. When they have firmed up, remove one of the piñata cakes from the freezer and add the final layer of frosting. 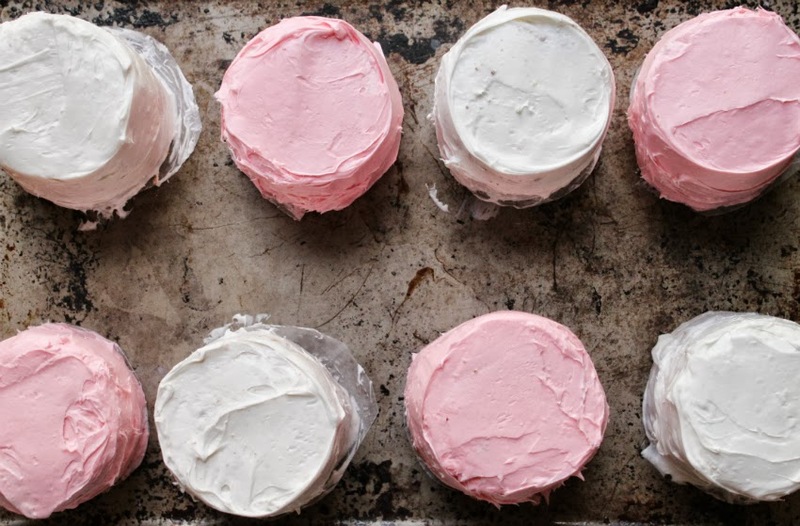 Repeat until all your cakes are frosted smoothly. I set mine back on a baking tray to display at the party. You might want to keep them refrigerated until close to serving time. They slice better if they are a little cold, but it's not a huge deal if they are not. 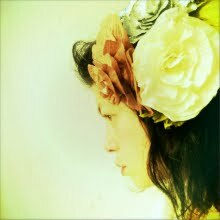 I also added the pretty touch of my vintage floral candle holders. So sweet! When you're ready to eat them, just cut a nice-sized slice from the cake just like you would a regular cake and serve. 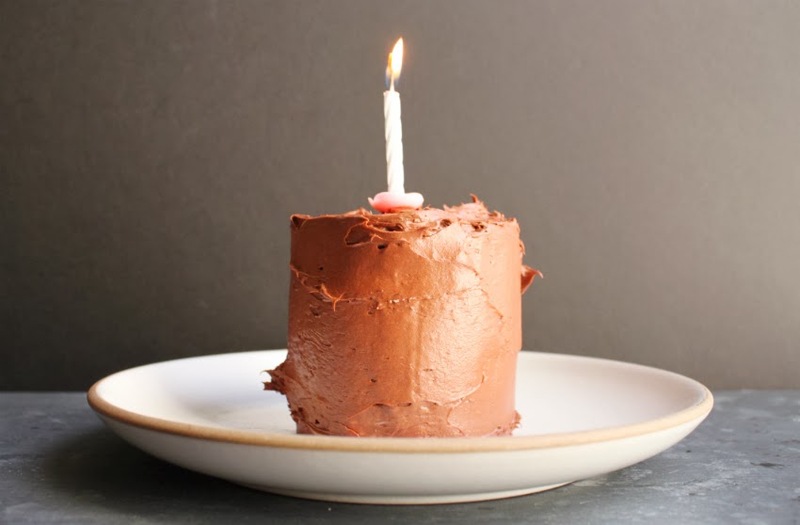 About a quarter of one cake is good for one person, to start. I frosted one with chocolate. So cute. Like I mentioned above, proceed with caution while eating. Make only for special occasions, and eat only in moderation! They are fun though, aren't they? I ate them all. ALL! They were sitting in the fridge and I chipped away at all of them over the past two weeks. Talk about sugar coma! You are a genius! So pretty and fun. This looks like a Wayne Thiebaud painting come to life. Yum. 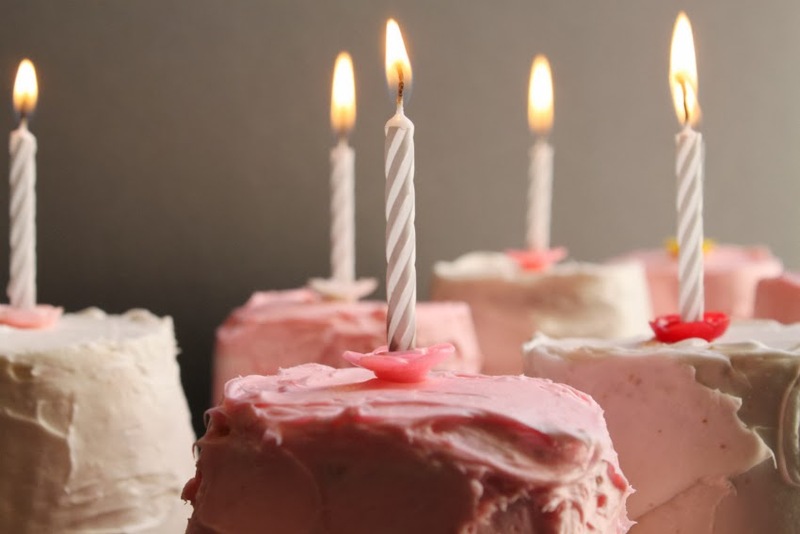 Does the candy become sticky from the moisture of the cake or from sitting in the fridge? They sat in the fridge for over a week while I slowly picked away at them, and surprisingly, no. The candy was not sticky. 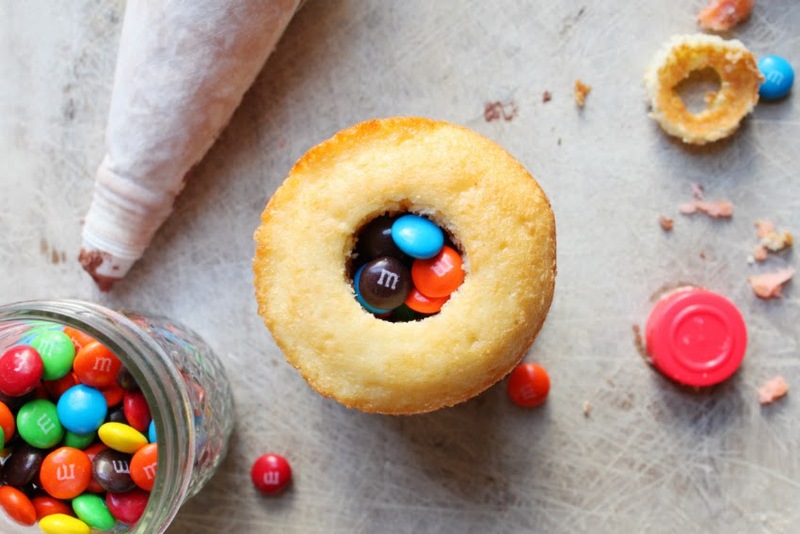 I used real M&Ms and they didn't even really get too much condensation on them. They did stick together a tiny bit, and if I had taken them out and brought them to room temperature again the colors might've run. So probably best to serve them after only a day of refrigeration at best. At least one hour in the fridge after you've assembled them makes extra sure that they won't slip apart when you go to cut them, but they are fine at room temperature, too. I just saw this on Pinterest and they are so pretty. You know what would be so fantastic? Since you are adding the treats after they are baked, you could put little toys in there instead of candy. Kind of like a king cake. Little rubber animal figures, small wooden tops, glass marbles or little glass animals or figures—depending on the age of the children, etc. Then it wouldn't be so sugar bomb-ish and possibly even more delightful! I'm Holly, I'm just picking anonymous because it's fast and I don't usually (ever) comment on anything. Thanks for posting. They are such pretty little cakes! This was a hit at my kid's bday and what I really like is how quick and easy they are. papel sf on one kings lane starting tonight!